To showcase and bring forth the “plus-points” of Kolkata and promote its image to people outside Bengal, a group of enthusiastic Kolkatans, professionals in their respective fields, decided to project the city’s image through a series of events under the name Happenings. They organised their first event in 2003. Since then a number of festivals have been organised. 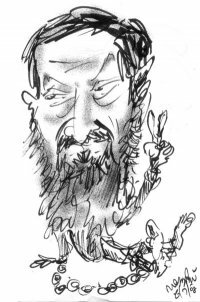 Under the guidance of mentor, the Late Habib Tanvir, Happenings organised the Tagore festival in 2006. 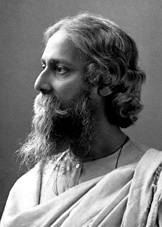 In the subsequent years, other facets of Tagore’s genius were delved into which included theatre, music and dance and a unique event in the 150th anniversary, presenting Tagore’s controversial novel Ghare-Baire ~ Home and the World ~ in the inimitable style of dastangoi. Organised in association with Maulana Abul Kalam Azad Institute of Asian Studies and the ministry of culture at the Maulana Azad Museum, the dastangoi has been a popular story-telling tradition in India since the turn of the 11th century but is now a dying art form. Originally told in Arabic and then in Persian, the art travelled to India and was adapted in Urdu and flourished immensely because of Emperor Akbar’s personal interest in the form. The dastans were presented by dastangos, who were mimics, actors, narrators ~ basically talented elocutionists who used to recreate and mould stories while performing. Revival in the last six years was mainly due to the effort of the famous Urdu scholar SR Faruqui and Mahmood Farooqui and also the actor, poet and Dastango Murtaza Danish Hussain. Prevalent for centuries as the aural form, the traditional repertoire ~ the Dastan-e-Hamza ~ the traditional stories have been printed in 46 chapters and forms a treasure trove of enchanting stories. Apart from traditional repertoire, Danish Hussain and Mahmood Farooqui have experimented the style successfully with contemporary themes, works of different styles and regions and this time it was the presentation of one of Tagore’s major works in Hindi, keeping true to the style of dastangoi. 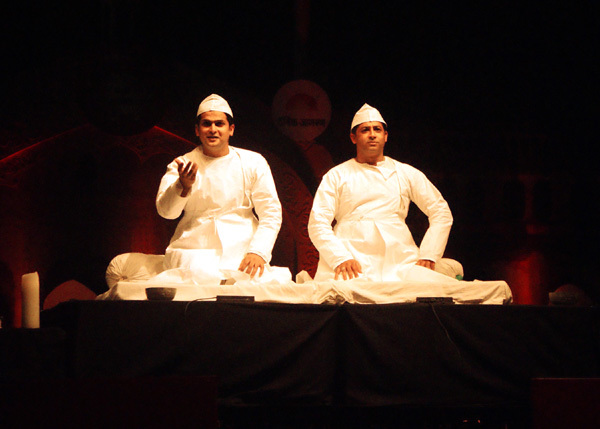 Ushering in the performance with a loud, dramatic khuda labz hain, the excitement of the style of dastangoi was initiated with a fable by the two actors dressed in white angarakhas, sitting with knees folded side by side with two silver bowls and a dastan each on the two sides. The novel was then presented in Hindi and not in Urdu for comfortable appeal adapting the translation of Surendranath Sen and Umesh Mishra. Set against the backdrop of the Swadeshi (home rule) movement in Bengal following its sudden and arbitrary partition by the then British viceroy Lord Curzon in 1905, the Home and the World was originally published in Bengali as Ghare-Baire in 1915. The story of three friends, the novel deals with the experiences of three characters during the volatile period of Swadeshi: Nikhil a benevolent, enlightened and progressive zamindar, his childhood friend and a voluble, selfish but charismatic nationalist leader, Sandip, and Nikhil’s wife Bimala, happy at the outset in her traditional role as a zamindar’s wife but who, encouraged by her husband, steps out of ‘home’ to better acquaint herself with the world. Carried away by Sandip’s adulation Bimala begins to fancy herself as “Mother India”. Her intoxication ends only after she has stolen money from her own house. Portraying the environment of the country of the then British Raj, the dastangos began in their traditionally assured style with chidiya choo choo nahin karti thi parinda par nahin hilata tha touching on with flattering lines tera rayat nainsukh payi phirangee tero raaj sundar sada rahio referring to the situation of “Bangalasa” (Bengal), bharat durdasa nahin dekhi jayi, the reference was with respect to the rule of Lord Curzon in 1905. The narration begins from the point when Sandip arrives with a hurah hurah and Bimala’s dialogue by Danish. Meer Taqi Meer’s popular sher parasthishkiye tak ke aye buut tujhe, nazarmein sabhon ki khuda kar gaye creates the initial attraction between Bimala and Sandip who explains that he arrives for khas kam desh ke liye. Farooqi narrates and portrays Nikhil’s role with dignity, restraint and high classicism smeared with the required emotion and profound significance. He shares the characterisation of Bimala elegantly with Danish. Danish’s baritone in his voice, powerful throw and energetic expression as also articulation makes him as lively a Sandip, and also as a coy and coquettish but desperate Bimala. Each glance, each gesture of the artistes were different and their facial expressions amazingly variable but wonderfully significant. Farooqui’s emphatic recitation of Vidyapati’s line e bhara bhadar maha bhadar was, however, a bit strong and clashed with the subtle nuances relevant to the original novel. The script was interspersed with lovely shers and for those with a taste for Urdu poetry it was highly rewarding. The intense moments of the novel were not only narrated with moving emotion but were punctuated with passionate shers like hum to bujh chuke hain mujhse tapesh nahin and Faiz’s ye raat us dard ka shazad hain jo mujhse tujhse azim tar hain. The rendition which is meant to be listened to but not spoken was extremely gripping and does not tamper either with the tradition of dastangoi or with the original novel. The Urdu poetry only enhances the appeal of the text. The artistes alternate their execution true to the Dastangoi style and captivate the niche audience from the beginning till the end. A very important aspect of this fascinating and aesthetic presentation is that the intersection of poetry, text, narration, recitation, theatre and drama and the authentic and characteristic style is entirely different from a sruti natak and should not be mistaken as an audio play. There was no background music. It was the high calibre of the artistes together with the beautiful ambience of the garden of the museum that made the Dastan-e-Ghare Baire a memorable experience. A Dastangoi adaptation of Rabindranath Tagore's classic novel 'Ghare Baire,' at Friends of Books' Book Swap Event. For more details please visit FOB's site. The event is open to all. The performance premiered at Kolkata in January, 2012 and this is the first time Delhi gets to see the complete performance of Dastan-e-Ghare Baire. 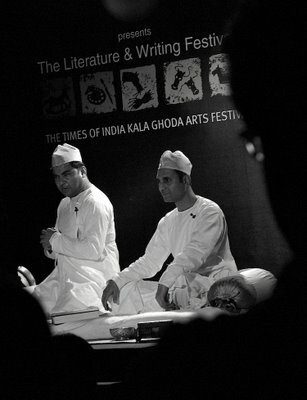 We performed excerpts from it at the Dastangoi book launch. Tales from the classic Tilism-e-Hoshruba as part of Dastangoi performance tomorrow Friday, February 17, 2012 at 4pm at Lady Shriram College, Kailash Colony, Delhi. Be there and enjoy the tales from Tilism-e-Hoshruba! at 7.00pm on Thursday, February 09, 2012.